I am a bonded and insured, error free, traveling Notary Public. Servicing the Greater Lehigh Valley area and beyond. 24/7 Service. I am also a NNA and “ASN Certified” Notary Signing Agent and a Certified Mobile Notary Public (CMNP). I am patient, meticulous and friendly. Although I speak several languages I do need you to understand the English language on the documents you sign. 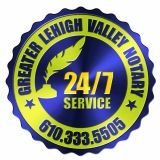 As a notary public, I am required to follow Pennsylvania’s Notary Public Law, 57 P.S. 147-169 and therefor request that you have proper identification available to you.